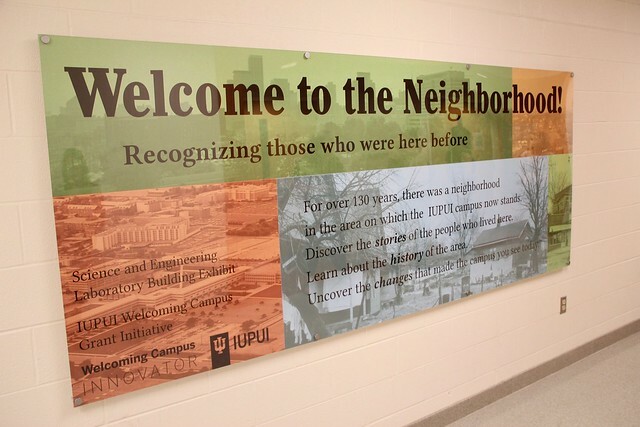 In accord with the goals of both the IUPUI Welcoming Campus Initiative and the IUPUI 50th Anniversary celebration, "Welcome to the Neighborhood!" is a historic exhibit in the hallways of the first floor of the Science & Engineering Laboratory Building on Blackford Street. The collaborators engaged IUPUI students in the museum studies graduate program to create a permanent display that celebrates the history of the people that have lived in the immediate area with an emphasis on the inhabitants and structures that were there in the 20th century prior to the formation of IUPUI.